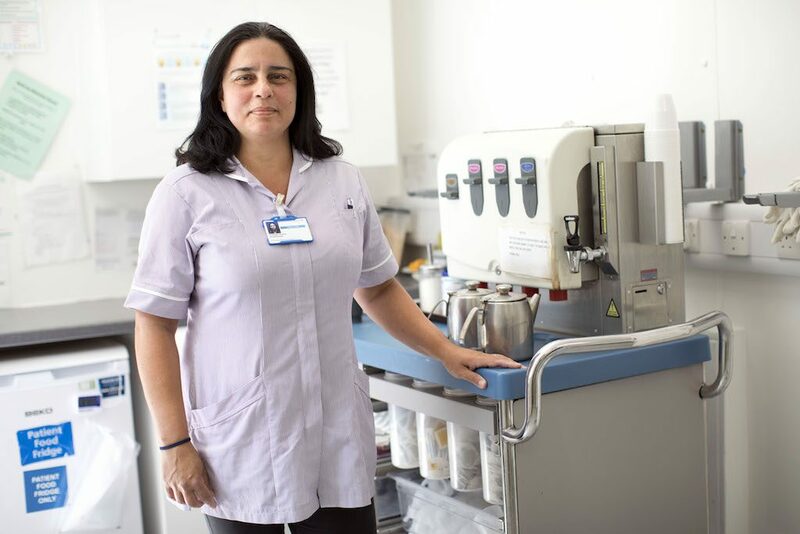 Kalliopi Kolagki is a nurse in the Accident and Emergency ward of Watford General Hospital. Originally from Greece, she’s been in Watford for 18 months and is one of hundreds of EU workers on the hospital staff. She’s enthusiastic and professional, and speaks of her experience as “very positive”. 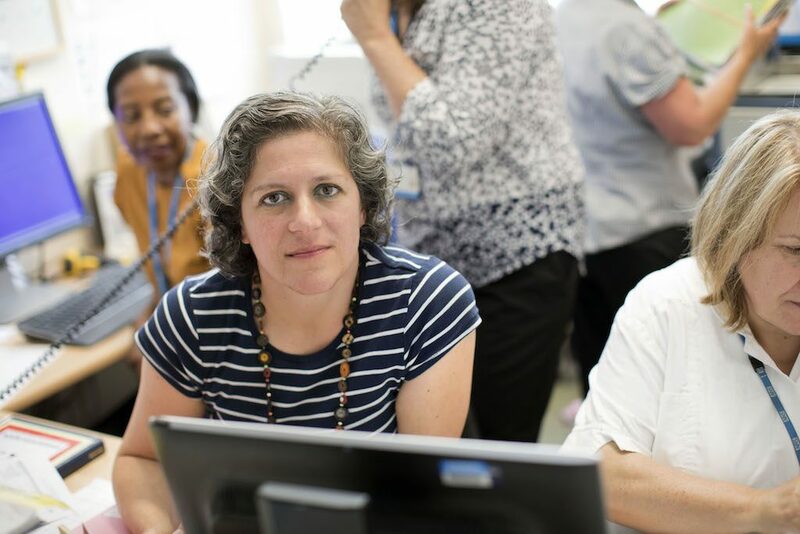 But she also has a very particular anecdote that speaks volumes about today’s NHS, for good and ill.
“On the shop floor – that’s how we talk of A&E – I’ve seen a certain change of behaviour since Brexit, from patients and relatives,” she says. “Because nowadays, they usually ask you where you come from. 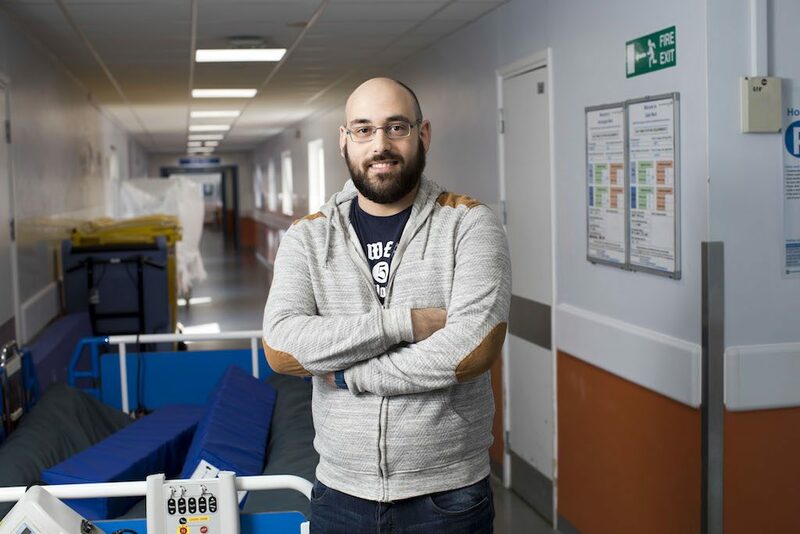 Watford’s branch secretary Jason Filintras, who is also a nurse from Greece, estimates that more than 50% of all the hospital staff – and 60% of the nurses – are EU workers. 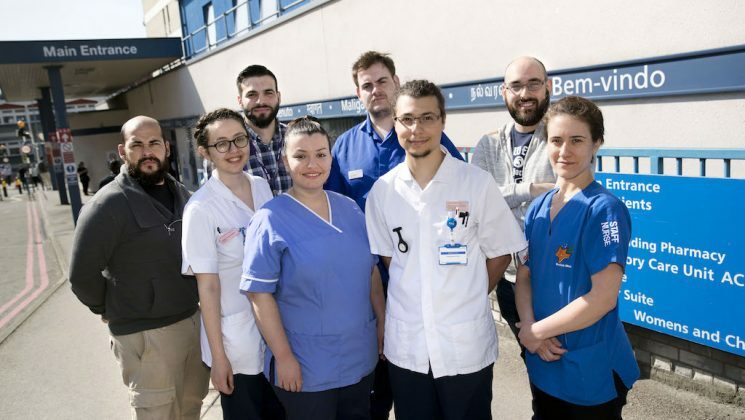 Jason observes that “no sane person would consider committing to nursing with the conditions that you have at the moment in the UK”, citing the government’s removal of the NHS bursary for nurse training and the under-staffing and stress of the job itself. Ironically, what is deemed a poor prospect for British people is an opportunity for someone from Greece, Italy or Spain – whose governments pay for their training but can’t employ them. “So in a way the UK is benefitting from those countries’ distress,” he says. This has been one of the conundrums of Brexit: the people whose lives have been thrown into disarray by the decision to leave Europe are essential to our public services. The general acceptance today is that EU workers will not have to leave the UK after Brexit. But despite government assurances, it’s understandable that many of those staff at Watford General continue to have questions and concerns. How do they register for what the government is now calling ‘settled status’? What happens if they make a mistake or don’t have the documents to prove their time here? What happens to their workplace rights? Their families? How will racism and discrimination develop in a country in this new era of ‘us and them’? And if the British government could change its mind about the Windrush generation, how can Europeans feel any more secure? No workplace illustrates the benefits of the European workforce, and the uncertainty caused by Brexit better than the NHS. Hospitals like Watford clearly couldn’t do without its team of trained and conscientious healthcare professionals. But it was recently reported that almost 10,000 EU NHS workers have left since the Brexit vote. One in five European doctors have made plans to leave the UK. And official figures have shown that the number of nurses from the EU registering to work in the UK has dropped by 96%. One additional reason for the drop-off in nurse registrations is the Nursing & Midwifery Council’s introduction, in the same year as the referendum, of the IELTS language test for EU nurses which, by all accounts, has been near impossible to pass. 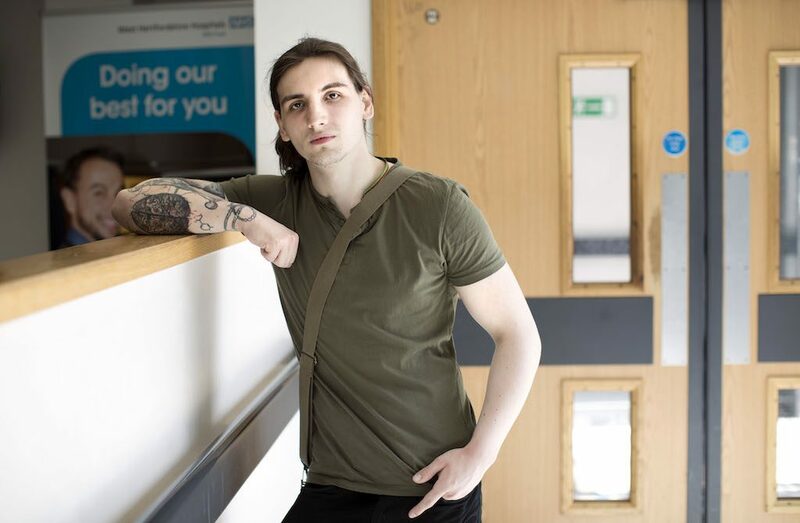 Jason, whose English is impeccable, has nevertheless struggled with it himself, meaning that he remains a transitional nurse, without the pay and career progression that would come with registration. 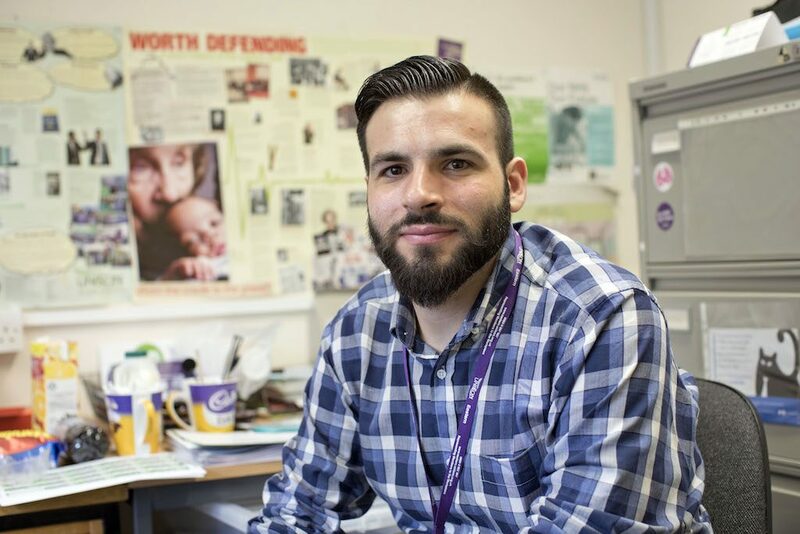 It’s a dilemma that affects a handful of the staff UNISON met on the wards – young people who were approached by recruitment agencies in their own countries, invited to work in the UK but given obstacles to progression and, with Brexit, doubts about their future. I believe that the NHS is one of the greatest healthcare systems in the world, so I said to myself – why not give it a go? But Jason remains determined and pragmatic. He joined UNISON because he saw the union trying to make sense of Brexit for its members, then started campaigning himself for the rights of EU citizens, and is now branch secretary. Right now, his chief advise to his NHS colleagues is to follow suit. “Try to get a bit more involved. Lots of people who are affected by Brexit didn’t get a chance to vote and have their say. 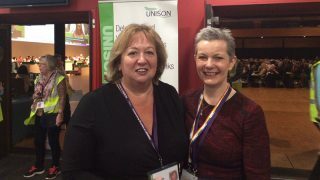 But through UNISON you can interact with MPs, you can lobby, you can demonstrate, and you can educate others about how Brexit will affect them. “Everyone has to go through the settled status process. And the more active and involved they are with the union, and express their worries and their feelings, the easier it is for us to take their issues to a higher level. Mia had been working as a nurse in Greece for six years, when she came to the UK in December 2016. “I came here to develop and become a better nurse. I believe that the NHS is one of the greatest healthcare systems in the world, so I said to myself, ‘Why not give it a go?’ And it was a good decision. 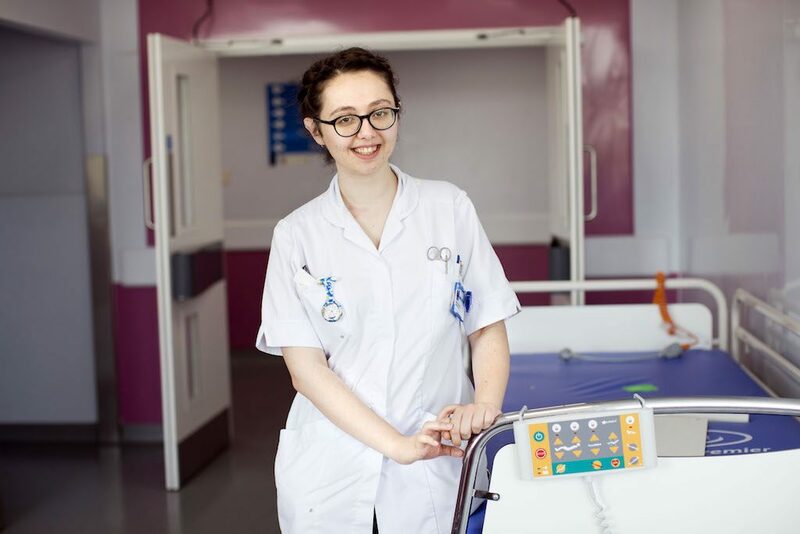 “I do feel very blessed to have the opportunity to work in a paediatrics ward. Caring is great, but the fulfilment that you feel is greater when you’re helping a child. And I definitely don’t want that to end. “Before I came to the UK, I had ex-colleagues who were already here. They were settled, they liked the environment, they said people were accepting of us coming from other countries. But that was way back, before the volcano of Brexit. Ioannis is on his second period in the UK. Previously he worked in a London care home. He has been at Watford General since February 2016. “I was assigned to this ward because of my previous experience in a care home. The ward is mostly elderly people, with fractured hips. Many have dementia. They need reassurance, and you need to be patient with them. “I really like working with elderly people. Each patient is different, each is quite challenging. Even small things make them happy, and the smile they give you is a big reward. “The NHS needs people, they need foreigners. I don’t think we have any English nurses on my ward – we have Spanish, Italian, Indian, from the Philippines, Romania. Only one staff member is English. 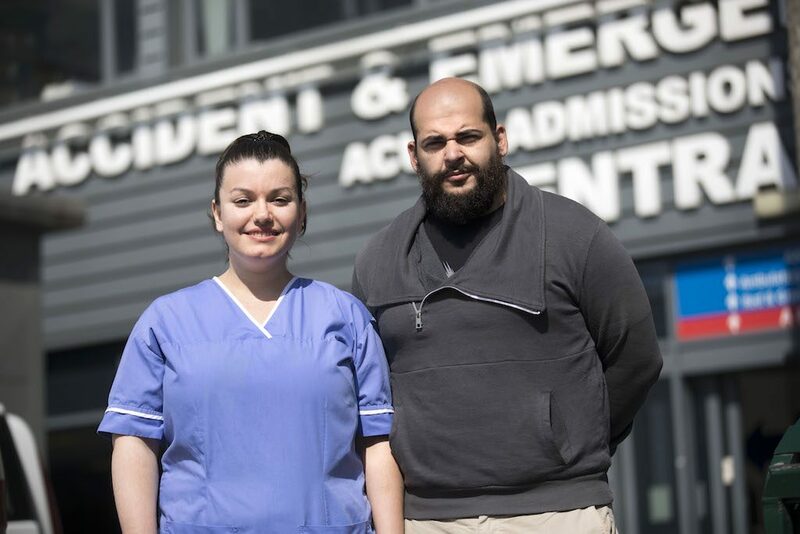 Roberto came to the UK in January 2017, immediately after completing his nursing training in Italy. Like many, he has had his progress blocked by his difficulty in passing the IELTS test. He came with his partner, who is working as a waitress. “I applied for a band 5 job. This is 4. I was assured the test was easier. Honestly, IELTS is a nightmare, it has a fail rate of 90%. “That test has just been replaced. The problem is the new one is four times more expensive. It’s £400. And I have to study on my own because they don’t provide us with courses. “Brexit scares me a lot because my plan was to come to UK, develop my job and build my family. So when you discover that you may not have rights in the country you have chosen to live in and you may be discriminated against – even if it’s not on purpose – you don’t know what to do. Cristiane is Brazilian, but came to the UK in January 2016 with her Portuguese passport, which she has through her grandfather. Her husband works as a finance assistance at a nearby school. They have two sons. “I was a civil engineer in Brazil for eight years. We left because of the violence. My oldest son, he was 15, was robbed five times coming back from school. I had the chance to live here. I knew it was possible to have a job like this and survive. “I didn’t come here for the money. I just came here for the quality of life. And for me it’s good, because my son can go out safely at night and I can sleep. And my younger son, who is just six, has been discovered by a Chelsea scout – I’ve never seen a kid play football like him. “This country gave me a possibility to survive and to have security for my sons. And they are having a good education here. Day by day our life is going to improve. I’m hoping that when my English is better I can start to do a better job. Jan moved to the UK when he was 10, with his mother, step-father and sister. He’s been a healthcare assistant at Watford since April 2017. “I would say Britain is my home. I have all my friends here, all my colleagues and most of my family are here. I’ve grown up here, I’ve learned here, I developed here. I’m a bit concerned about what’s going to happen after 2019, but I’ve been here for a while, so I guess that’s better than for some. “There have always been one or two [racist] comments. But there’s been an increase, in general, since Brexit. And there are so many of us Polish people here. I think people are scared of those numbers. 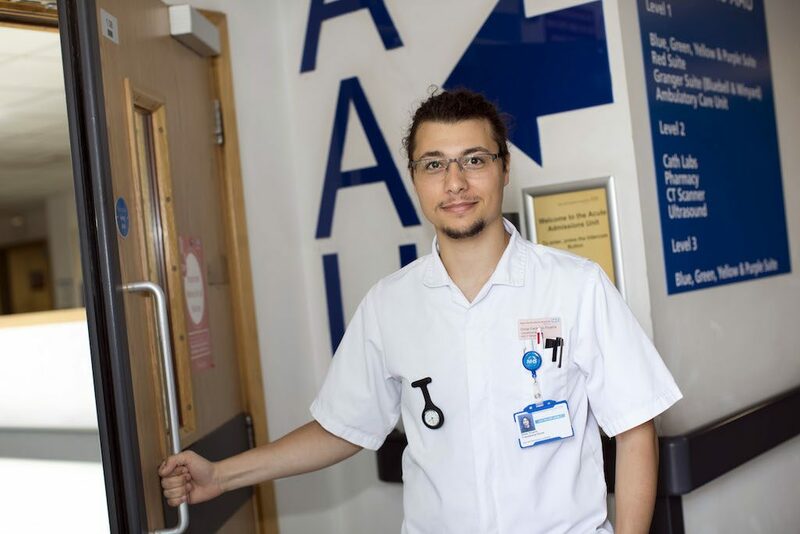 Omar has been a transitional nurse at Watford since January 2017. He too is having difficulty passing his language test and therefore becoming a registered nurse. “I came here because of the unemployment in Italy. It’s very difficult for nurses to find a job there. I saw an advert on a website, for a job in Watford, had an interview and passed. So I jumped on this adventure with my girlfriend. She is also a transitional nurse, on another ward. Antonio (above, with A&E colleague Kalliopi Kolagki) served in the Italian army, before changing career to nursing. He worked first in Italy, and has been at Watford General for three years. “A&E is the only place, the only job, the only lifestyle that makes me feel that I’m doing the right thing. It makes me feel that I can actually make a difference for people in need. You have to be spot on, on top of the wave all of the time. Elisavet had the foresight to take her language test before leaving Greece, only for the Nursing & Midwifery Council to lose her documents. As a result, she has been unable to register for more than a year. “My ward is general surgery, light orthopaedic and urology. I like it because it’s fast and you have a plan – patients are pre and post op, they go, they come back, you take care of them, they leave. It’s a fast process and every part of it has to hit the mark. And I find it fascinating. “I would be happy here if I had my [registration] pin. I have support from the hospital to understand what went wrong and to get registered finally. Mariana has lived in the UK for 15 years. She worked first in hospitality and then, on returning to work after having two children, she joined Watford General. Her husband is a general manager in a hotel. “I first came here because I wanted to improve my English. I got a return ticket for six months, but then I met my husband here. He’s Dutch, and this is common ground for us, speaking English and not each other’s language, so we decided it was a good place to stay. “At first I found the EU referendum shocking. I thought, ‘Really?’ England is one of those countries with a good economy, which receives immigrants to work here. I don’t think the vote was necessarily against anybody coming to the country, it was more about politics and how things are run. At the same time, who are the easiest to blame – the weakest, the newcomers, the ones you can identify as not yours. “I’ve never been afraid that I couldn’t stay, because I’ve been here a long time, I own a house, and I’ve kept most of my paperwork, just because I’m like that. But other people don’t – your P60s, your P45s, all those things, you don’t keep them. And when Europeans came we came legally, and we didn’t need all that. Now they say you need to prove you’ve been here for five years. It’s the same as Windrush – it’s a bit too late. “But actually, we are leaving. My husband was not happy in his job and started looking for something. And he found a job in Holland. “He was looking for a job at the same level as here in the UK. Although he has a lot of experience, and had a lot of interest, it always came back to ‘thank you, but no thank you’. Because employers are unsure about how it’s going to pan out with Brexit, it’s easier to go with the English person than with the one who has to have a visa to stay. The government has said that all EU citizens and their families who have been in the UK for five years by the end of 2020 will be able to apply for ‘settled status’, which will allow them to continue living and working in the UK indefinitely. Those who have been here for less than five years will be able to apply for a temporary residence permit until they have built up enough years to apply for settled status. In June, Home Secretary Sajid Javid said that the government’s “default” position would be to grant, not refuse such applications. However, UNISON remains cautious. Questions remain about the application process. And EU citizens could still be at risk if the UK government and the EU fail to reach a final deal by Brexit day on 29 March 2019. UNISON is recommending that members do not voluntarily register at this stage. What they can do is keep as many documents as possible showing the continuity of their time in the UK. We suggest using the settled status checklist provided by the3million on its website: www.the3million.org.uk/checklist. We are also updating our guidance Getting Ready for Settled Status to assist the union’s EU members, which will be available on the UNISON website and sent to branches in due course.